If you are like me, you may have been dreaming about this moment for a very long time. Whether that is the case, or you are just beginning to imagine your own backyard oasis, deciding who you want to move forward with to create your dream pool scape is no small decision! TLC has been featured and recognized by several media outlets, including Aqua Magazine, HGTV, DIY, Fine Living, and A&E. They have also received top honors, winning several design awards for remodeled outdoor living spaces, including the coveted Houston’s BEST Prism Award, presented by the GHBA for two years running! These accolades reinforce the fact that you will not find a more qualified and trusted builder for your custom pool than TLC Outdoor Living. Your imagination (and budget, of course) is the only limitation to what can be accomplished when you hire TLC to create your dream backyard escape. Your overall experience, when working with TLC, will be equivalent to working with a trusted friend, who always has your best interest in mind. Only, with TLC, this friend has a wealth of knowledge and experience in creating and bringing to life the most breathtaking pools and backyard retreats that you have ever seen. If you are serious about creating the perfect backyard living space, you have only one clear choice on who to entrust that task to. TLC Outdoor Living is simply the BEST at what they do. 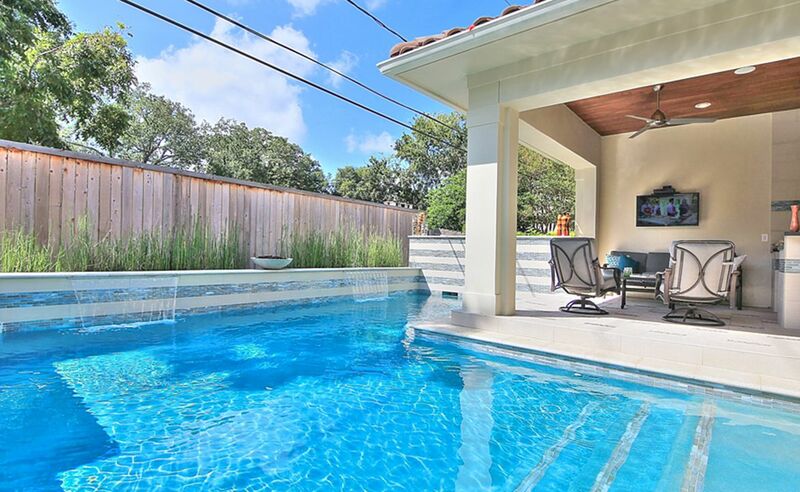 When you want the best outcome, you should choose the best Houston pool builders. TLC makes that choice easy for you. With their proven track record, completely customizable designs, vast experience and good old fashion “Know How”, you will find yourself the envy of all who chose an inferior builder. Known for crafting some of the best custom work in Texas, TLC Outdoor Living’s showroom is located just outside of Houston, and Cypress, in Tomball, Texas. TLC Outdoor Living is the proven best choice of luxury pool builders in The Woodlands, Texas. Stop by for a visit of their new, state-of-the-art store front, located at I-10 and Hwy 99. Inside the luxurious TLC Store, you will be able to see design ideas for spas and hot tubs, grills, patios, luxury pools, as well as unique and stylish accessories. You can even enjoy the “wet experience”, which is TLC Outdoor Living’s unique opportunity for you to demo the most cutting-edge technologies in the latest Spa designs. I do not know of another store that offers an actual sit down inside of a working spa. They will even provide you with some trunks if you need them! You will have to bring your own tropical drink. While visiting the showroom, you will be able to speak with a knowledgeable member of the staff, who will cheerfully help you develop your pool and patio concept and guide you on the process of creating or enhancing your outdoor Dream Space. From Concept to Creation, TLC Outdoor Living will work right along and beside you to create your ideal backyard getaway. From pools and spas, to patio kitchens and hangouts, TLC is the builder that The Woodlands can trust to create a custom living space for years of relaxation and enjoyment. From initial concept, through design and planning, all the way to your first cannonball into the deep end, TLC will live up to their famous initials and handle your pool project with Tender Loving Care. Your new pool scape and backyard retreat will wow guests and provide a welcome escape from the intense heat of Texas summers. They can even provide heated options, so that you can enjoy your pool year round!. TLC can help you enhance your Outdoor Living environment with swimming pools, water features, BBQ’s, fireplaces, outdoor kitchens, landscape lighting and landscaping that entice and reward your outdoor activities. You will be able to share unforgettable moments with friends and family from your own backyard resort-like paradise!. Your beautifully landscaped pool will be designed to be a private retreat from the stress of everyday life. With multiple choices on lights, water features and deck furnishings, your completely customized pool will pamper and provide a way to refresh, relax, sun bathe and entertain throughout the afternoon and evening. The beautiful, long lasting structures will add value and grandeur to your home for decades. They will then create a computer-generated animation of actual pool design and water features, so that you can see the finished project goal before the construction of your pool ever begins. Your Project Manager will then be able to create project cost estimates for construction and materials for your pool build, along with contingencies based upon your final approvals. Upon completion of the install, TLC will work with you on the training and familiarization with the operation and understanding of your new pool’s care and equipment use. Even well after your first swim, TLC’s expert staff will always be available to answer any questions you may have during the lifetime of your pool ownership. With decades of experience in creating beautiful landscapes, aquascapes, patio covers and decking, outdoor kitchens, and resort like luxury pools, TLC Outdoor Living is your ideal partner in creating the outdoor paradise that you have always wanted.